A PRETTY WELL used term has been bandied about in recent months to describe the position British boxing finds itself in. The game over here, according to many, is in a ‘transitional phase’, due to the recent crop of high-profile retirements, defections to the US and subsequent shortage of headline acts. It is true enough that the departure from the sport of the likes of David Haye, Tony Bellew, George Groves and James DeGale does leave something of a void that needs to be filled by the relevant promoters or broadcasters. However, when I have spoken about transition myself, it has been about the propelling of the next wave of our young stars to the top, or towards the top, of the bill. From our squad at Queensberry, only Carl Frampton has indicated that he is entering into the final few chapters, so we are in pretty good shape as the work we have put in over the last number of years nurturing potential stars is coming to fruition. We have Billy Joe Saunders, Tyson Fury, Anthony Yarde, Jack Catterall and Nicola Adams all in mandatory position for, or closing in on, world title fights, with the likes of Liam Williams not far behind. Carl Frampton too, I am sure, will soon be back in the world title mix. The thriving British super featherweight scene is hotting up, with Sam Bowen and Archie Sharp leading the way and Zelfa Barrett and Lyon Woodstock in hot pursuit. I rate them all highly and wouldn’t rule any of them out of pushing on for world honours. Lerrone Richards is another I expect to make big strides over the next 12 months or so and he is in a great fight with Tommy Langford on April 27 at the SSE Arena, Wembley, where another talented young super middleweight, Zak Chelli, fights for his first title. Chelli is one of a crop of hugely exciting young fighters we have that include Sunny Edwards, Lyndon Arthur, Tommy Fury, Willy Hutchinson, Ryan Garner – the list goes on and there are far too many to include them all here. The heavyweights will play a big part in our promotions going forward and we have two of the best young heavies in the business in Daniel Dubois and Nathan Gorman. They are both making rapid progress when you consider their ages and Daniel gets the opportunity to headline at Wembley when he takes on the world-ranked Richard Lartey. If he does the job we expect of him against the dangerous Ghanaian then he has a British title shot against Joe Joyce in the pipeline and a huge encounter with Nathan before the year is out. We have got big plans for Nathan too that are soon to be revealed. So I really don’t think it will be too long before our current world champion count of two – Josh Warrington (who makes a second defence of his IBF world featherweight title against Kid Galahad on June 15 in Leeds) and Zolani Tete – will be significantly increased and I firmly believe we are entering into an exciting era and one that will stand the test of time. The reason for this is because the discovering and development of new young talent is always an ongoing process for us and we have never looked to be overly reliant on Olympic products entering the pro ranks every four years. True, we have signed a number of Olympians over the years, but having such a background has never been an essential qualification in my book. You only have to look at recent success stories such as Tyson Fury, Carl Frampton, Josh Warrington, Terry Flanagan, Liam Smith and others to see that not having an Olympic pedigree is no barrier towards professional success. Further back, the likes of Ricky Hatton, Joe Calzaghe and Naz proved as much. Not every talented young amateur wants to wait around for an Olympic cycle. Our recent signing, nine-times national champion Dennis McCann, just wanted to turn pro at the earliest opportunity and he would have been a strong candidate for the GB team. To reinforce our commitment towards providing an ideal pathway for young fighters to progress in the professional ranks, we have teamed up with Pat Barrett and Black Flash Promotions in order to increase the opportunities and activity for new pros. I’ve known Pat since his fighting days when he was trained by Brian Hughes at the great Collyhurst and Moston club and he was one of the real big punchers who you always felt was going to do it. He is a boxing man through and through and is currently continuing the great works carried out by Brian. He is developing some really exciting talents – with Zelfa Barrett and Lyndon Arthur being the best known examples – and he is relentless in his efforts to give young fighters the best chance of success. Pat came to us with a proposal to work in tandem with his gym and promotional company and we are delighted to support his operation. We will place some of our young talent on his shows to speed up their development and keep them busy, while those who impress on Pat’s platform will be rewarded with the chance to shine on our shows on BT Sport. Investing in young fighters is what we have always done and will continue to do. We deliver on every level from starting out either on our undercards, or Black Flash shows, to being showcased on BT Sport, to ultimately becoming a Box Office star when the occasion demands it. 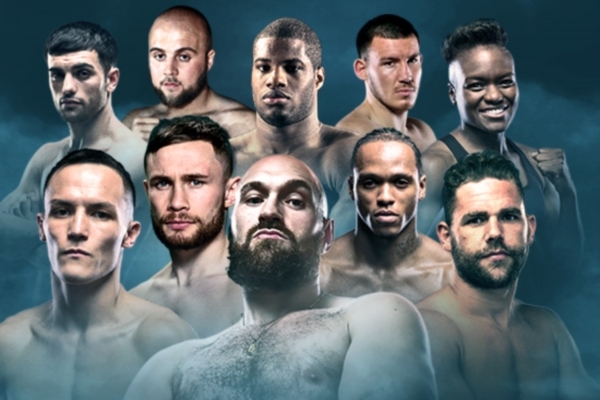 The attraction of fighting Stateside will always remain an option for some, but we don’t intend on shipping home-grown fighters across the Atlantic to fill up undercards for the benefit of the US market and to the detriment of the home broadcaster and fans. The way to avoid transitional periods has always been to continually invest in the nurturing and development of young fighters because they are the lifeblood of our sport. BoxNation subscription is £12 per month plus £8 registration fee for Sky TV. €15 per month plus €10 registration fee for ROI Sky TV customers. £11 per month with no registration fee for Virgin Media customers. £12 per month and no registration fee for TalkTalk, Freeview, EE, online and app (iOS, Android, Amazon) customers. No minimum term. [QUOTE=Clegg;19648230]McGuigan last I heard. [/QUOTE] Thanks............ That's why he doesn't get much more hyped up. [QUOTE=Ray*;19648211]Who promotes Taylor? [/QUOTE] McGuigan last I heard. 'we have never looked to be overly reliant on Olympic products entering the pro ranks every four years.' Customary dig at Matchroom/Eddie..check. Hell hath no fury like Warren scorned!